Spring is in the air… Or is it?! It actually SNOWED in Chicago on Sunday, and I’m not talking a few flurries. We had a straight up winter snow storm and the snow was falling down all day and well into the night. Crazy for mid-April, right?! I remember last year when I was at Coachella and hearing that it was snowing back in Chicago on that Sunday of the festival and being so glad that I wasn’t in town for it! Last year, I believe it was just a few flurries, but this year it was almost blizzard-like conditions with the wind! Spring, where are you at?! We’ve had a few (read: one or two) beautiful days that have gotten me so excited for spring, and well, summer. Is it just me or does spring seem to not really exist in Chicago? In my mind, it tends to be a vicious cycle where we have one nice spring-like day, followed by ten more days of winter. But even as I’m sitting at my desk writing this post right now, it appears to be sunny and blue skies outside and my weather app is telling me the high will be near 50 today! Which is a start contrast from Sunday afternoon when it looked like I was living in a snow globe. Ov vey! 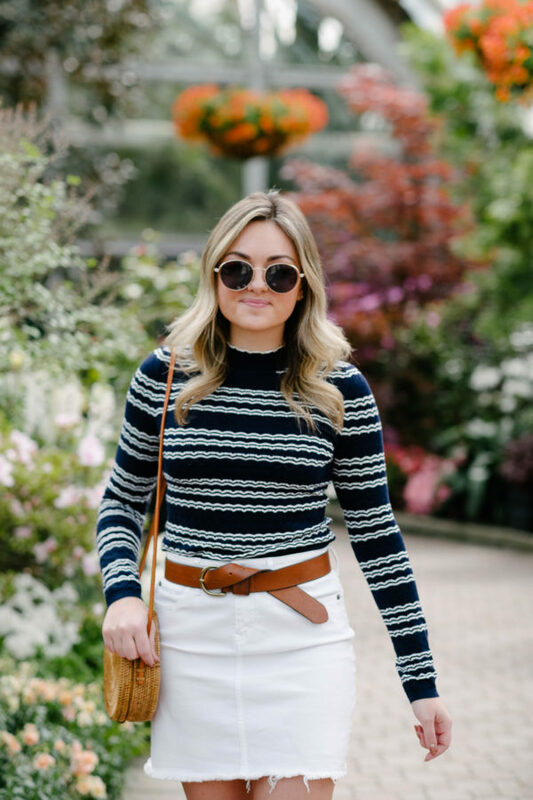 I styled this mock-neck pointelle striped sweater with a white denim skirt and my favorite white sandals that I just picked up. These braided white slides look SO much more expensive than they are (they’re $55 and I also got them in brown!) and I know I’ll be wearing them on repeat all summer long. Skinny jeans, cropped flare, jean shorts, dresses, skirts, you name it. They’re classic and go with everything, especially in a seasonally-appropriate shade of white or can’t-go-wrong cognac brown. 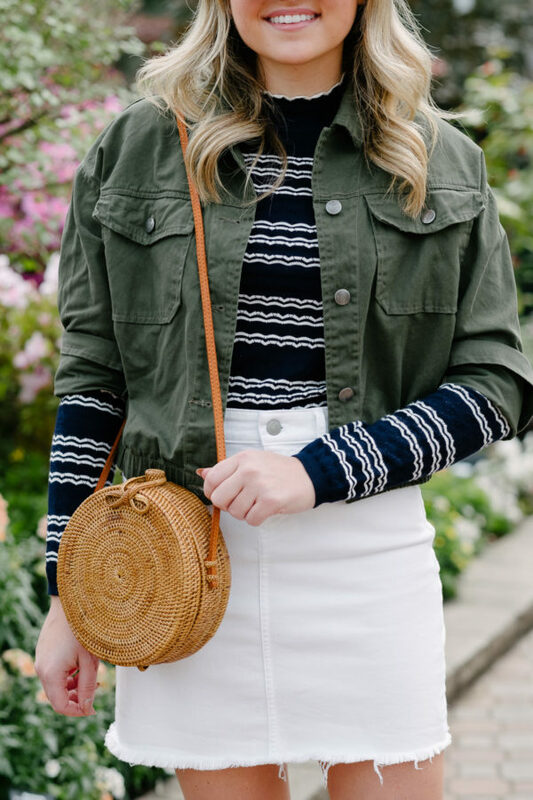 If it’s still a bit chilly and you need a third piece, I think a cropped army green jacket does the trick! And if not, simply toss on a leather belt to make your outfit complete. I love this outfit styled both ways so I wanted to show how I would wear it now (with the jacket) and later (sans jacket + belt). I first found Prive Revaux sunglasses last year when I was shopping for new Coachella shades! Right after Coachella, I headed to Japan so you can see them a lot in this post: What I Wore in Japan. When it comes to what I wear to a music festival, the more inexpensive, the better. Everything tends to get very dirty and I’ve lost *countless* pairs of shades while dancing at shows! So when I found Prive Revaux last year and saw all of their sunglasses are under $30, but could pass as designer shades, I was sold. Small frame glasses are all the rage right now, but they can be hard to pull off if you’ve got a round face shape. (Like I do! 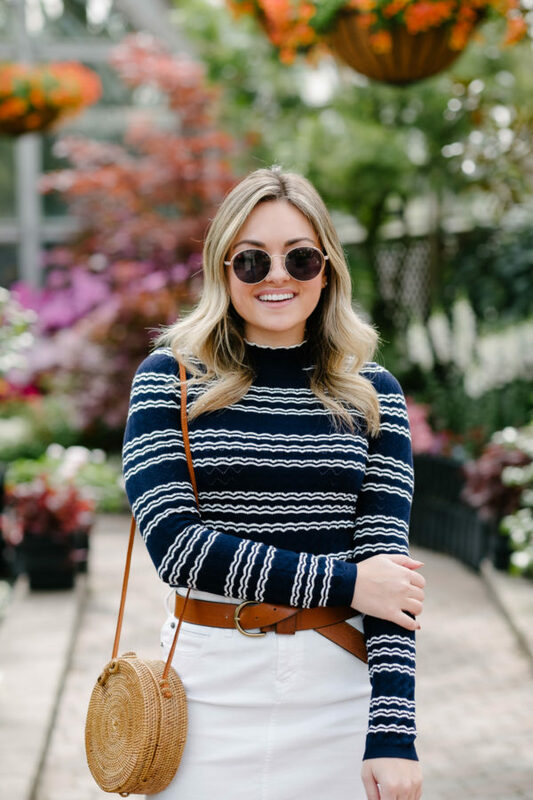 ‍♀️) Sunglasses can be super hard to shop for online (thank goodness for free returns! ), but I took a gamble on this semi-small pair and absolutely loved them when they arrived in the mail. While the lenses look round, the frames stick out a bit wider than the lenses, almost making them more of an oval-y shape, which suits my face and features so much more! I’ve worn them daily since I got them a few weeks ago, highly recommend. Would you believe me if I told you that you can shop everything I’m wearing at Walmart?! Believe me, initially I was just as shocked as you probably are. When Walmart reached out about working together, the timing was pretty eerie. Just a week or two before, I was listening to my favorite business-y podcast (you can see the full list of my favorites here!) and they were talking about how Walmart has been CRUSHING IT. If you follow me on Instagram Stories, I actually talked about this on there! When I agreed to take part in a partnership with Walmart, I made sure that I would be able to solely feature fashion items from their “Premium Brands” section. First and foremost, staying true to myself, my voice, my tastes, and my brand that I’ve built is the most important part of any collaboration that I say yes to. But as I got to shopping online, I was actually pretty impressed with so many pieces that were outside of the “Premium Brands” umbrella. And just to make sure I was doing my due diligence, I ordered a ton of extra product (on my dime, mind you) to try it out for quality, fit, etc. And honestly, I was just as impressed in person! Truly. 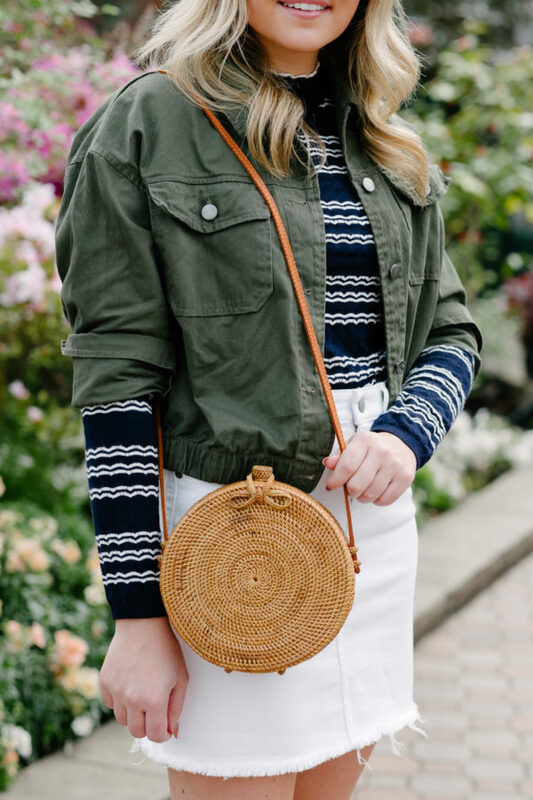 If I hadn’t been impressed, I would have just skipped over their own selection of items and solely featured items from their premium selection or their collaboration with Lord + Taylor like we originally agreed upon. I picked up this floral maxi dress under $20, these criss-cross slide sandals under $30, and this $12 belt bag to get my trendy on. And I purchased these sunglasses under $30 elsewhere last year, but Walmart carries them! I’d love to know… Have you purchased anything at Walmart lately? Did you know about their free two-day shipping on most items? What has your experience been? Let me know in the comments below! This post was created in partnership with Walmart. Thank you for supporting the brands and collaborations that make Bows & Sequins possible! These layers are so cute Jess! 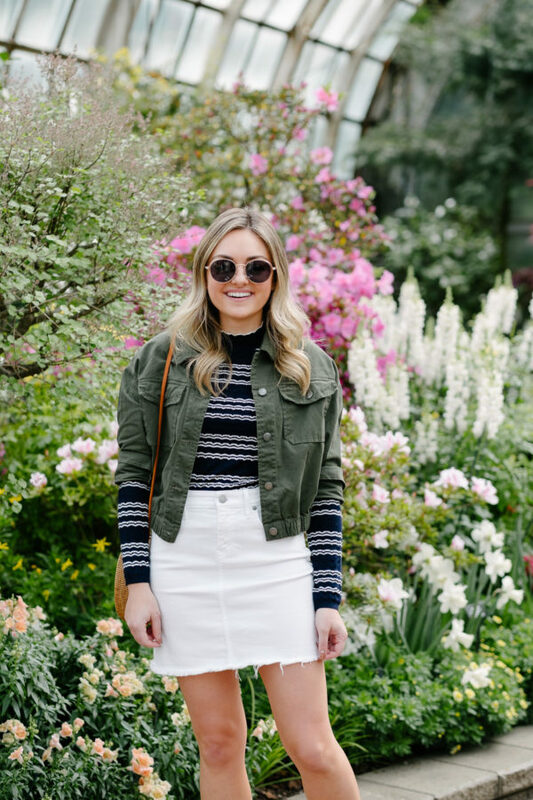 Love the white sandals and skirt with the navy and olive. Thanks, Nicole! 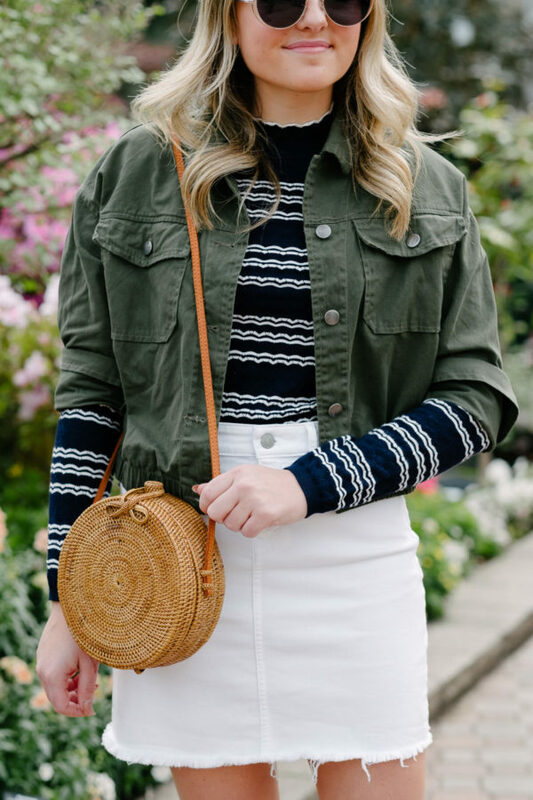 Navy and olive is such a classic combo… I love it with white in the warmer months and cognac brown in the fall/winter. I bought some dresses that bloggers were raving about on instagram and they looked cute “for pictures” but were the worst quality. Now I’m trying to figure out how I want to return them. That’s too bad! I was impressed with the quality of the two dresses I ordered. One was a Miss Selfridges dress so Walmart has nothing to do with the quality, they’re just the reseller. And the other dress I ordered, the $19 maxi dress I linked above, I was expecting to not love the quality, but I thought it was great. And at $19, I definitely can’t complain! Bummed to hear you didn’t have the same experience on the items you ordered. But thankfully returns are free! I had to return a few of the items I ordered and it was insanely easy… Just select the items you want to return in your order history and print out a free shipping label! 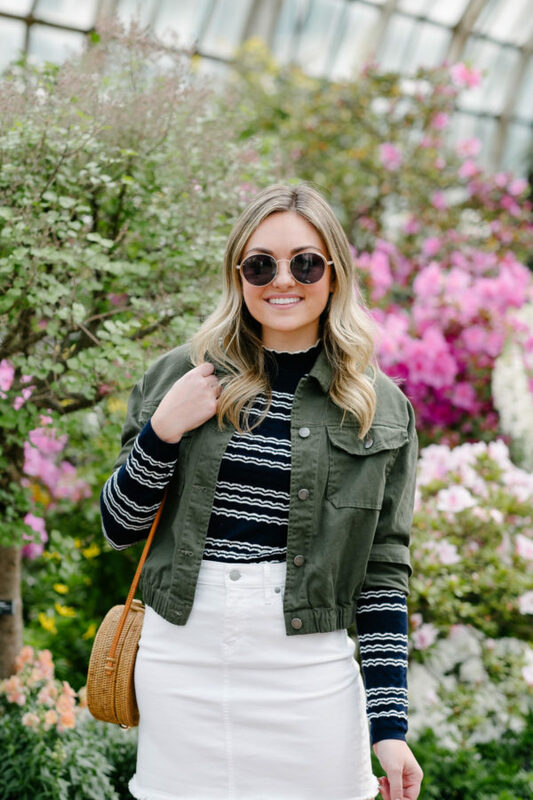 You look cute in your spring look! Weather has been weird in my country as well, today is super rainy and cold and just last sunday was warm… That’s a gorgeous outfit, I love the layers and the different lengths, you styled then beautifully. I’m not familiar with the treatment of their employees, but I appreciate you taking the time to weigh in and leave a comment! Nice! I’ve seen a ton of cute things in their Ellen Degeneres line, too. I think online is probably where the best selection of merchandise lives anyhow! You are over the top gorgeous! We know you need to make a living but partnership with Walmart feels cheap and inauthentic. We know you don’t shop there and it is a company that has been frequently cited for inhumane treatments of their employees in the US and abroad. I generally enjoy your content as a blogger but this was a huge miss for me. Hi Jennifer, You’re more than welcome to your opinions (although leaving them here in the comments is totally optional), but I think you’ve missed the mark. Not once did I make a false claim, or say or wear something inauthentic to me, my voice, or my style. Have I shopped at Walmart since I lived in my hometown growing up? Nope, I haven’t, and I certainly didn’t claim that I did. 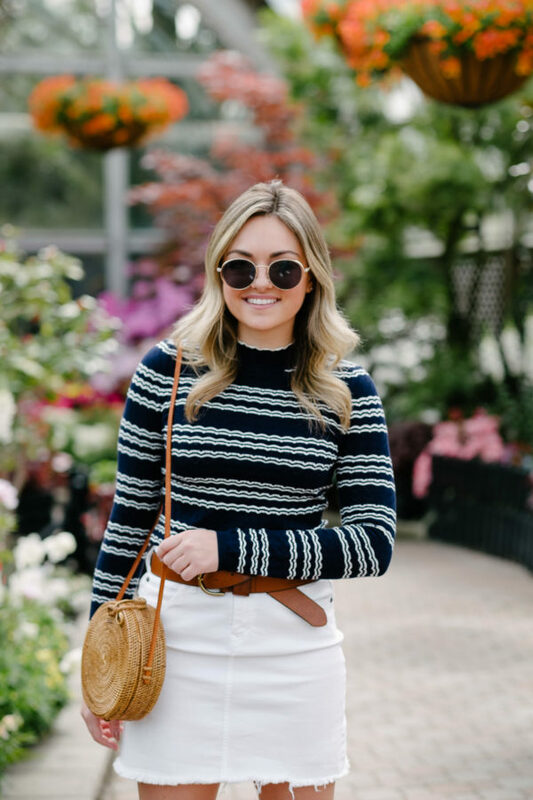 When Walmart approached me for this collaboration and I learned everything I mentioned above (their collaboration with Lord & Taylor, free two-day shipping, and a good selection of affordable finds), it seemed like a no-brainer to take on the partnership. I’m not sure that you DO know that I need to make a living… If you did, I don’t think you’d be leaving this type of comment on my blog trying to shame me for the decisions I’ve made for myself and my business.